Professors teaching courses across the Higher Ed business curricula consistently tell us that while most are interested in exploring new methods of effectively engaging students, the time needed to research and implement these materials into their courses can feel quite daunting. 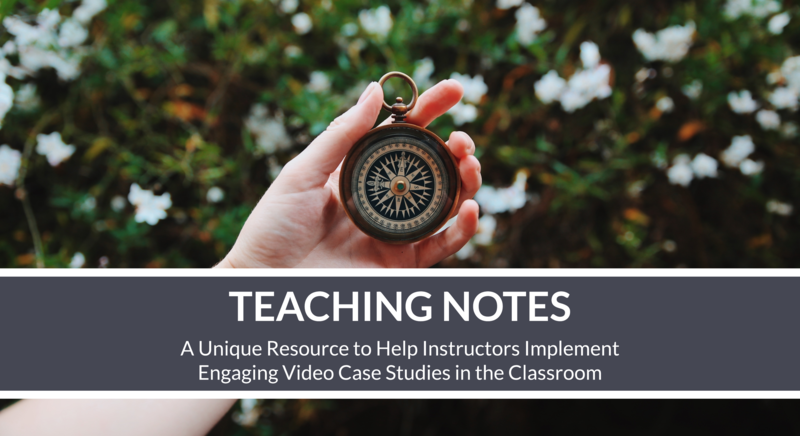 To support the professor, Real Time Cases offers a resource known as the Case Study with Teaching Notes to supplement their video-based case studies. These Teaching Notes serve as a guide by offering context, preparation for guided discussions, assignments, and much more. 1.) How does it help with student engagement? These notes increase engagement via storytelling techniques: providing background information on the case via Setting the Stage, creating a space for students to interact and share their thoughts on the case through guided Discussions, and bringing the Real Time Case to life with Assignments. One of our favorite parts is Alternative Lenses, offering challenges that invite students to apply related theories to the case study in unconventional, “out of the box”, ways. 2.) How does it empower professors? The Setting the Stage section provides instructors with a quick overview of the most important information on the company, case specifics, key players, etc. All Teaching Notes offer relevant Objectives, Theory Identification and Application, as well as Major Considerations for each case. A Sample 4-Week Plan serves as a template for Group Projects, easily adaptable to the individual instructor’s desired timeframe for the assignment. 3.) Who authors the Case Study with Teaching Notes? The resources are designed and authored by members of our Faculty Contributor Network who are also professors, and published by the Real Time Cases editorial team. Click here to access a preview of the Case Study with Teaching Notes. If you are looking to increase student engagement in your classroom, you may access a full Teaching Note by registering on the Real Time Cases platform here.